PLOTTER Epson Stylus Pro 9900 with CISS - Inksystem - save money on ink! 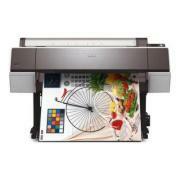 Buy Plotter Epson Stylus Pro 9900 with CISS and make 30 times more quality prints for the same money! Pay only 0.04 USD for A-4 full color print! Epson Company offers a new industrial plotter. A technology of separate cartridges was used in its manufacturing. It is recommended to use this printing device in advertising. Due to the construction of Epson stylus pro 9900 you can choose ink cartridges of standard or extended capacity. You will get an economic set of ink cartridges of extended capacity in a set. The continuous ink supply system, which is installed in Stylus pro 9900 Epson, has eleven separate cartridges. They provides smooth linear gradient of printed images. Due to the printing resolution up to 2880x1440 dpi, you will get vivid and contrast prints with a wide range of tints and color shades. There is also a separate cartridge of extended capacity for Epson UltraChrome HDR ink. This ink was used in stylus pro 9900 plotter, as well as in similar models in this class. Epson UltraChrome HDR ink was manufactured for digital color printing especially. In accordance with the statement of manufacturer, due to the appliance of this ink, you will get brighter, colorful and contrast prints. Moreover, if you use original consumable materials from Epson Company (ordinary paper, photo paper and ink), the light resistance of prints will be higher, and the durability of your images will be about 20 years. Epson stylus pro 9900 you can forget about edges trimming. Furthermore, you can use the whole paper surface that is why you don't need to choose a special format of paper. Due to the availability of a roll holder, the printing of panoramic images is possible. Also, Lightfast standard printing is available. It is possible to use Matte Paper (Heavyweight paper from Epson), which will provide you with a high level of light resistance of the printed images. If you keep the images in a photo album or under special glass, the durability of prints will be up to 20 years. 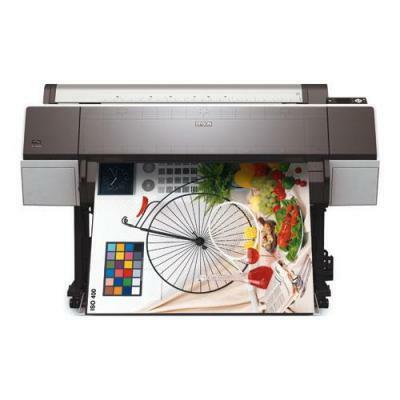 The printing resolution of epson stylus 9900 is 2880 dpi. It allows you to print different texts, diagrams and photos with very high quality. Thin Film Piezo printing technology was applied in epson pro 9900. Due to it the printing speed will be rather high without loss of quality. This printing device has a system of separate ink cartridges of extended capacity. This system makes it possible to change only the reservoir, where the ink was over, but not the whole cartridge. The case of Epson stylus pro 9900 is very stylish. It is executed in light-gray colors. There is a vertical tray for automatic paper feeding and a special roll-out platform for printed images. The plotter epson stylus 9900 pro meets all the requirement of European Standards. It has ENERGY STAR certificate.